If you’re reading this, you’re probably one of eight million people who dream of there being a sanctuary in the Arctic. And a year ago, you quite likely had a good feeling when you discovered that your voice, combined with others’, really works. By joining together we managed to force one of the biggest oil companies in the world to abandon the Arctic. Shell had millions of dollars and a host of lawyers but we had the passion of millions of people. There are 18 days left before the OSPAR commission decides whether or not to protect a small piece of the Arctic. These international waters should be part of the heritage that belongs to the world, not to oil companies or fishing industries. Before our very eyes we can see how climate change is opening up a new ocean, which is still the least protected on the planet. If we can save this area of the Arctic, approximately 226,150 km2 will be protected. That’s right, only 10% of the Arctic will be safeguarded – but it’s a great start. Unfortunately, Denmark, Norway and Iceland are blocking the whole process. They don’t want the OSPAR Commission to make a decision on protecting this area of the Arctic during the meeting that starts on the 20th of June (in Tenerife, Spain). Despite being in international waters that do not belong to these three countries, and the fact the OSPAR Commission has the legal authority to protect the area, and even though the countries that form part of the Commission have acknowledged its environmental value, it’s quite possible that in 18 days’ time the proposal turns into a worthless scrap of paper. Will the members of the OSPAR, who have the obligation to protect the marine environment, give way to the interests of just a few? We need you. 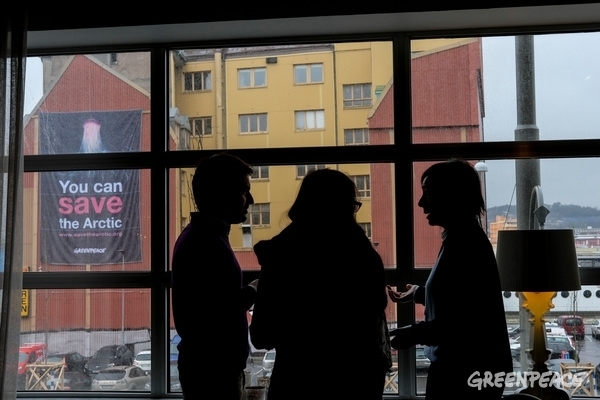 Now is the time to join in with your voice to ask for the protection of the Arctic. With you, we’ll reach the Arctic to claim its protection. You know why the Arctic is so important, because everything that happens in the Arctic affects us all, even if we are thousands of kilometres away. The whole planet suffers the consequences of a vulnerable Arctic. Join in with your voice; tell politicians why it is worth protecting the Arctic. We are 18 days away from a decision that could mark the real beginning of the Arctic Sanctuary. What is your reason for protecting the Arctic? Write it here and we’ll make sure it reaches the Arctic. Pilar Marcos is an Arctic Campaigner for Greenpeace Spain.